Do we need a “.CN” domain or URL? Will it help to improve my rankings? By China law, only a China registered office can apply for a .CN domain. For search rankings it really does not matter. Once your domain and account is registered and your content is up and indexed, you have the served search ranking values as local all domain addresses registered on the Search Engine (eg. Baidu). And Chinese are quite used to viewing international URL addresses. Your local URL (eg. “yourbrand.com/cn” or “yourbrand.co.uk/cn”) shows viewers they are at the genuine pages of your site. Does Google Translate work well in Chinese? Viewers will see instantly that you are using translation software and rather than reading past line 1 of garble they will generally click somewhere else. Actually for Google translate it’s strongly advised not to use it. Using translation software greatly confuses your message and can harm your brand image. Having quality Chinese shows the viewer your brand appreciates both Chinese culture and their business. To assist our international clients we provide quality translation services. Does Baidu operate in English or other languages? No. ChinaSEO provides weekly or monthly translated metrics, data reports and analysis in English. We already have Google and Yahoo SEO and accounts, does that help in China? Yes, there is some value in Google SEO. But, it is relative compared to Baidu. Baidu the number 1 currently has around 70% of daily search queries in China. Google.com is totally being blocked currently. What audience is important to you depends what SEO and PPC budget to allocate. For all clients we recommend to open a Baidu account also. SEO is not overnight. And the longer you are active in SEO, the more cost effective it is for your business. 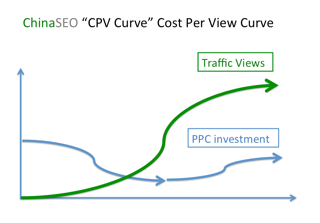 This CPV Curve is the ratio of traffic/ new views against the cost of PPC for those views. Once you get “brand traction” you will see your numbers of viewers steadily increasing whilst your PPC can remain relatively the same. This greatly increases your ROI and this is the aim of all good SEO practitioners. What can we do if the core keywords are banned in PPC in China? This happens in China, if you touch gambling or sexual games in PPC activity. By keywords analysis, some of relevant keywords or similar keywords will be advised for your consideration. Another clue is to follow potentials activity and figure out those keywords related to their online behaviours. This is indirectly targeting but works somewhat in the particular situation. What’s the right time for me to start a search engine marketing campaign in China? No time like the present! Firstly, with nearly 300 million people using the internet in China, and therefore more than 200 million of them using major search engines, the potential Web audience is so large that a strategic approach to capturing your share of that market is critical. Obtaining higher rankings in the major search engines is one of the most effective marketing tools you can implement in today’s online world. Secondly, we usually establish 12-month campaigns. There is an enormous amount of education, research, analysis, technical programming, and testing performed in the first 3 months in particular. What are the costs to expect? Cost is relative to how important the web to your business is, and, just as importantly, to your competition. If your competitor is active in SEO and you rely on the web for part of your business, then they are setting the benchmark for you. For example: a small luxury, niche hotel or, OEM producer will spend $12-16K per year on SEO. A large hotel chain or, highly active brand can spend $20-30K per month on SEO. SEO, Search Engine Optimization, is the process of improving the volume and quality of traffic to a web site from search engines via “natural” (“organic” or “algorithmic”) search results. The goal of effective search engine optimization is not just adding traffic – it’s about growing your online business by reaching qualified consumers of your products and services. With about 298 million people using the Internet and about 200 million people using search engines in China, the potential online audience is so large for businesses that a strategic and sustainable approach to capturing that market is vital. Highly competitive web businesses such as e-commerce, tourism and online booking portals, universities and education providers, FMCG brand, OEM high techs, financial, investment, real estate and legal sectors are all active in SEO. It is relative to how important it is for you to be found online. How important is web traffic to your business? Competition matters. How much weekly and monthly competition there is for your top Key Words and Phrases. (It may be a little, or, it may be a lot). Bid prices go up and down throughout the year, hot words and phrases rise and fall. How Search Engine friendly, designed and engineered is your web page? PPC strategy, calendar and campaigns. You might want to drive up traffic for one quarter then conserve PPC for a seasonal campaign. On a scale of 1-10, for your target market what level of brand awareness do you have in China? Those with high brand awareness can focus PPC on seasonal campaigns. Those with low awareness will need to get active and invest SEO to gain and hold new market share. How does SEO compare to my other marketing investments? Companies continually re-evaluate the effectiveness of their marketing programs against changing buying patterns, but never before has there been such a rapid and intense change as the onset of the Internet. Search engine optimization is still relatively new and within the past five years, only the largest and most aggressive companies have rated it into their strategic marketing plans. Today, the science of search engine optimization is becoming an integral and dominant aspect of any company doing business online. Given the size of the potential market available via the Internet and the ability to instantly reach potential customers anywhere in the world, at any time, search engines has leaped ahead to become a critical marketing tool. No longer can companies ignore its effectiveness if done strategically, and done right. How Do You Choose the Best Keywords? The first step in our SEO campaign is to develop your Keywords Profile through Keywords analysis. Based on your initial input, we will use a combination of experience and technics to generate a list of the most effective and well-searched keywords in your industry. We then work together to refine this list and compile the list of keywords and phrases that will be most beneficial to your product or services. You know your business and we know ours. We know how important it is to work together to generate the most effective Keyword Profile possible. Will You Need to Access Our Web Server? Yes, we will need access to your web server in order to upload and periodically update pages. We do our best to keep you informed every time we do an upload or make a change. It is vital that anyone else who may be making changes to your site stays current with the optimized pages we provide. Do You Have to Make Changes to Our Site? While many of the changes made to your site are done behind the scenes in the source code, it may be necessary to make certain minor changes to your site’s copy or layout. In most cases, these changes are minimal. We post all changes made to the front end of your site to our test server for your approval before we go live with the changes. Can I see how my competitors are ranking for my targeted keywords? Our company can provide you Site Competing Analysis, Keyword Analysis and Monthly Ranking Reports services. They can offers you up to several competitor sites to be included such as the site ranking 1,5,10,20 etc., so you can compare at a glance how you are ranking in comparison to them for the same search terms. Can you guarantee a number 1 position in the search engines? Nobody can guarantee a number 1 position or specific ranking for your site for a given keyword or phrase in the organic search engine results. There are simply too many factors beyond anyone’s control – the search engines changing their ranking algorithms and rules, efforts made by competitors, and new sites being added to the Web. How often do you resubmit my site to search engines? If your site is search engine compatible and optimized correctly, regular resubmission to engines is generally unnecessary although we find that monthly submissions to some search engines assists in maintaining rankings. Our ranking reports and maintenance checks keep track of your site every four weeks. If your site is already ranking highly, there is no need to resubmit it. However if any engines have lowered or dropped your site altogether (as can happen from time to time), it will be resubmitted to those engines. If an engine has dropped your rankings considerably since last report, it is time to tweak your META tags or check the optimized pages for any problems. This is included as part of your Monthly Site Ranking Management Service. Search engines will generally pick up the changes during their next edit and re-rank the site accordingly. Resubmission is usually only necessary if your site has undergone major content changes. How often will I receive search engine ranking reports? How will I know if my business increases as a result of top rankings? Our monthly tracking report can help you to track the effectiveness of your campaign. By the end of the first twelve months, you will get an analysis of your activity at the end of the campaign as compared to the baseline established at the beginning of the campaign. What’s the best SEO tool? The main tools in SEO world fall to 3 sections, keywords selection, on-page optimization and link building. Nowadays, much more get involved, as for SEO analyzing, SEO performance. SEO itself is just a tool to comply with marketing strategy, to serve for business objectives. How long does the SEO work take? 3 months to see any trackable, reliable gains in traffic results. All this is very confusing and I still have some questions about your services. You are invited to contact us with your concerns before, during and after the campaign. Clients always get priority handling: we are here to help you get better rankings and understand what we do.